Removing all of the tracked changes in your document is a two-step process: first turn off Track Changes, and then accept or reject the changes in your document. After that, you'll have a clean document that’s ready for you to share with others. Click Review > Track Changes. Next, permanently remove any markup in your document. The only way to do this is to accept or reject changes and delete comments. Important: Tracked changes appear when a document opens. Choosing No Markup from the list of markup options on the Review tab by clicking All Markup > No Markup, helps you see what the final document will look like—but it only hides tracked changes temporarily. The changes aren't deleted, and they’ll show up again the next time anyone opens the document. To delete the tracked changes permanently, accept or reject them. Click Review > Next > Accept or Reject. Word keeps or removes the change and then goes to the next one. To accept all the changes at the same time, click the arrow below Accept and click Accept All Changes. 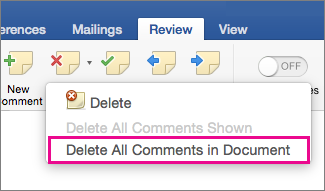 To remove comments from your document, delete them. Click the comment, and then click Review > Delete. To remove all comments at once, click a comment, and then on the Review tab, click the arrow below Delete, and click Delete All Comments in Document. Tip: Before you share the final version of your document, it’s a good idea to run Document Inspector. This tool checks for tracked changes and comments, hidden text, personal names in properties, and other information you might not want to share widely. To run Document Inspector, click File > Info > Check for Issues > Inspect Document. Important: Tracked changes appear when a document opens. Choosing No Markup helps you see what the final document will look like—but it only hides tracked changes temporarily. The changes aren't deleted, and they’ll show up again the next time anyone opens the document. To delete the tracked changes permanently, accept or reject them. Word keeps or removes the change and then goes to the next one. To accept all the changes at the same time, click the arrow by Accept and click Accept All Changes. Click the comment and then click Review > Delete. To remove all comments at once, click a comment and then on the Review tab, click the arrow by Delete, and click Delete All Comments in Document.